Who's Behind the Knitted Animals in San Francisco's Civic Center? Art is all around us in San Francisco, from the Mission murals to the Bay Lights. It even looms over us with the new video installation atop Salesforce Tower. It has become such a part of our everyday visual inventory that it's easy to overlook. Especially somewhere as busy as the Civic Center. But Bay Curious listener Robin Duryee says she loves looking for unusual things when she’s walking around the city. The retired nurse has lived in San Francisco for 43 years. 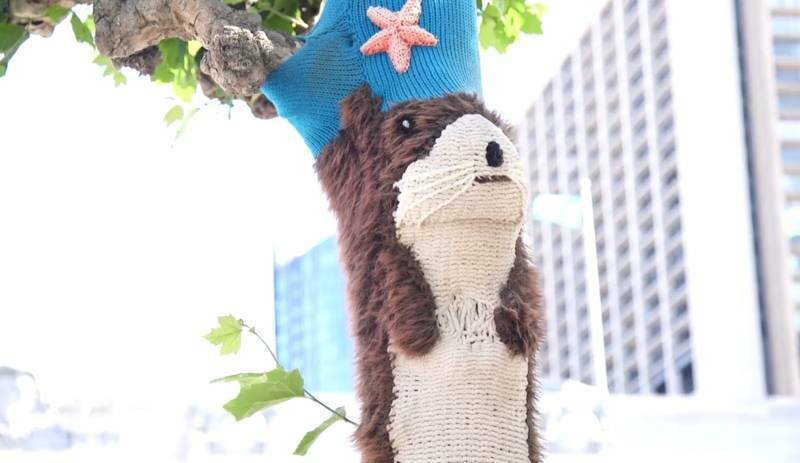 On a recent trek from BART, she spotted adorable knitted animals near City Hall: chameleons with leopard spots, brown fuzzy otters and giraffes licking branches with long pink tongues. 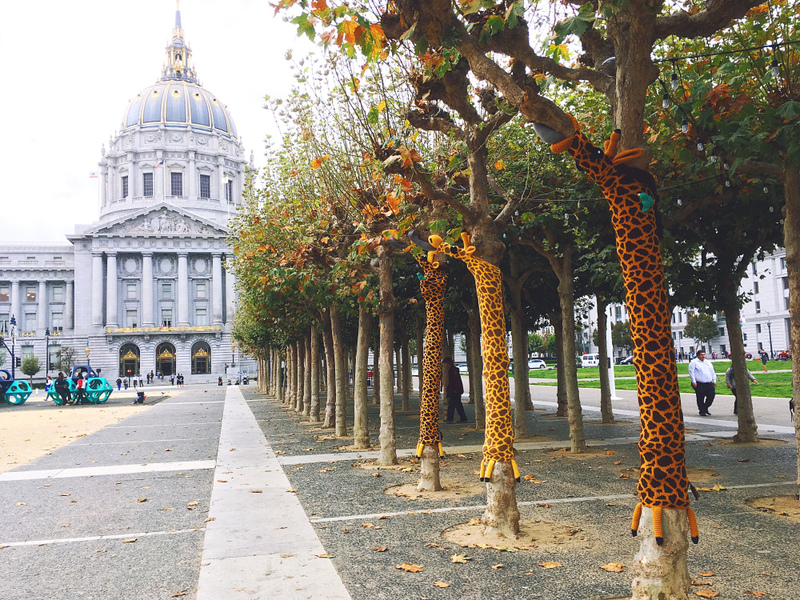 Which brings us to Robin’s question: What’s the story behind the knitted creatures on the trees in Civic Center? 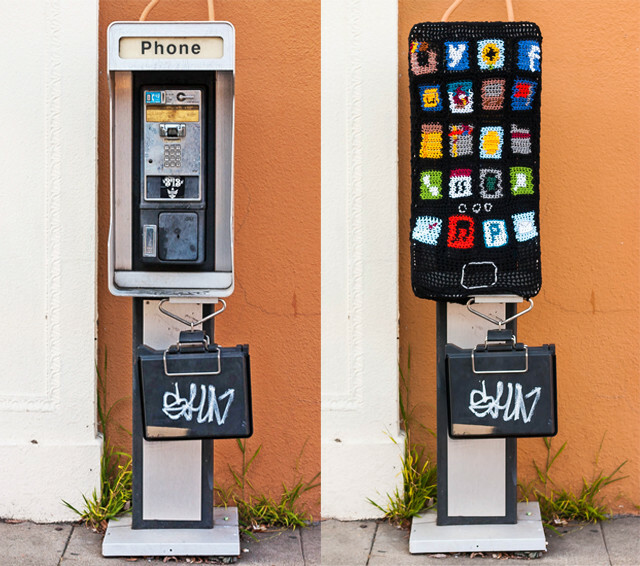 What Robin saw in the Civic Center were yarn bombs: street art made from knitted or crocheted fabric. They can be as simple as a green snake wrapped around a bike rack or as elaborate as covering an entire bridge. It’s been called a feminist answer to graffiti. LISTEN: Who's Behind The Knitted Animals In San Francisco's Civic Center? Yarn bombing is often traced back to Texas artist Magda Sayeg. In the mid-2000s, she crocheted a door handle for her Houston boutique. That was followed by a knitted tube around a stop sign pole. She eventually moved on to much larger yarn bombs (including a bus in Mexico City), and inspired and encouraged knitters worldwide to create yarn bombs of their own. The animals in the Civic Center were created by Lorna and Jill Watt, sisters from San Mateo. Each piece takes about a week to make. 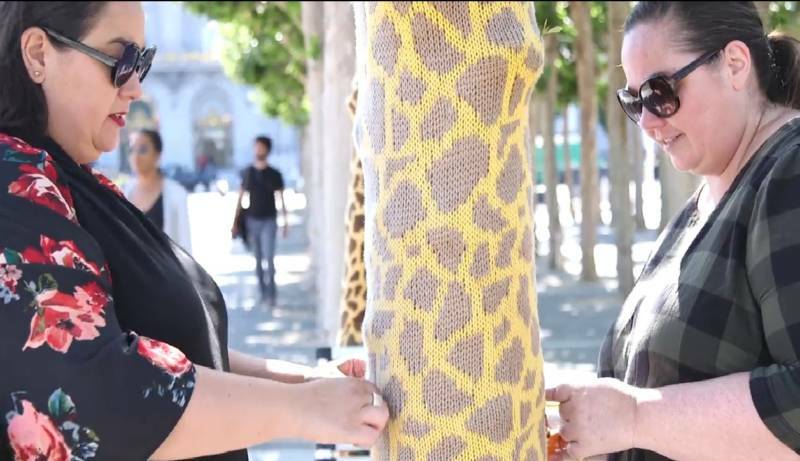 The rotating installation -- which occupies Civic Center Plaza, a block of Fulton Street and U.N. Plaza -- is part of an ongoing project called Knitting the Commons. Working with the city, a nonprofit called the Trust For Public Land hopes to turn locations like the Civic Center into "joyful community places." For six years, the sisters have made this kind of work their full-time gig, creating all kinds of yarn and string art under the moniker Knits For Life. “Yarn bombing is the perfect way to make something and then put it somewhere that is not our closet,” Jill says, laughing. But one thing that makes a yarn bomb is the sense of surprise. Like graffiti, a lot of yarn bombs get put up when no one is looking. "That first yarn bomb is so nerve-wracking, and you feel like such a vandal, and such a criminal," Lorna says. "We went after dark and she was installing them and I was a lookout," says Jill. "A cop car passed ... didn't care. We did it and we didn't get in trouble." That yarn bomb was so successful that it eventually led to work with companies like Old Navy, Twitter and Google. But the sisters haven't forgotten their crafty roots. To encourage more folks to get into yarn bombing, they recently hosted a Yarn-Bomb-Along. Ready to give it a go? Check out their patterns for Monster Feet and Snakes.